It’s no secret that I’m a huge fan of Don McAllister’s ScreenCasts Online video tutorials. Over the years I’ve learned so much from Don. His tutorials are simply the easiest way to gain exposure to apps for the Mac and iOS, and to get a deep dive into Apple’s new operating systems when they come out. The only sad thing for me is that Don hired me to help make the tutorials for him. On the one hand it means that I learn a few apps really well because I have to teach them, but I don’t get as many tutorials to watch as the rest of you. I’m bringing up ScreenCasts Online again because Don has just released a new app just for ScreenCasts Online members. Normally I’m not a huge fan of dedicated apps, especially for podcasts. But in the case of Don’s tutorials, there was a real problem to be solved. First of all, only a few podcatchers out there provide for authenticated podcasts. Since Don’s tutorials are a subscription service, you do have to log in with your member’ credentials. Downcast became my favorite iPad podcatcher, and it worked a dream all year long but I always have dreaded the end of the year. Every time we had to go through the very tedious and unintuitive process of re-authenticating. I don’t know if it was just me, but I found it really really difficult to follow the instructions to sign up each year. I would often wait weeks or even a month before slogging through the process again. With Don’s new SCO Members Tutorials app for iPad and iPhone, you download it from the App Store, tap your finger to Touch ID to authenticate with 1Password, and boom, you’re done authenticating forever! It that were all this app did, I’d be thrilled! But of course it does much more. Before I go on, I want to clear up a little bit of confusion. Don also has an app called SCO Showcase for iOS. This app is for those of you who are not yet members. You get a few tutorials here and there for free (which is awesome) and you can also buy tutorials a la carte if you hate subscriptions. Great option, but I warn you, you’ll get addicted! Back to the new SCO Member Tutorials app. One of the advantages of a ScreenCasts Online membership is that you get access to the entire back catalog of hundreds of tutorials. To get good performance out of the app, Don decided to limit the app to 2013 forward, and I think that’s great. Longer ago than 3 years is a bit stale anyway. You can always log into the website instead if you really want something farther back. 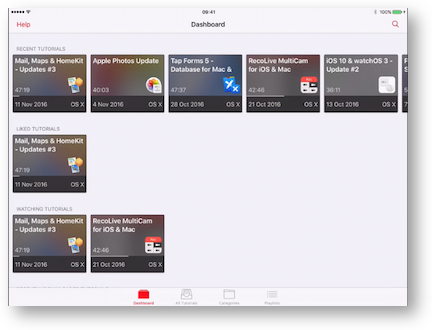 Don’s put a lot of thought into how the app can make it easier to discover and watch the tutorials you want. You can stream videos or download them for offline viewing. You can filter shows by categories, set up favorites to which you want to return later, You can see which ones you’ve already started to watch. You can filter and sort by date released and by title. Don is a taskmaster (as a boss) about including lots of chapters in the creation of the tutorials. From your perspective, this is awesome because you can jump forward or back a chapter and jump to just that bit you care about. He’s also rabid about accessibility for the deaf, so of course he enabled the ability to toggle on and off subtitles. One thing that happens often for me is I’m watching a tutorial for an iOS app on the iPad, but I also want to play with the app he’s talking about. 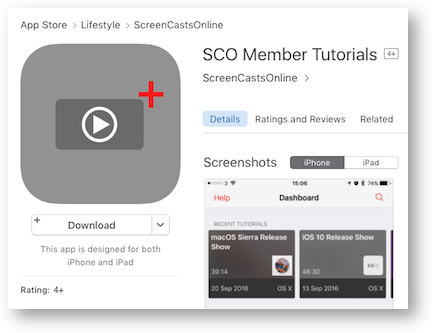 With the new SCO Member Tutorials app, he’s enabled picture-in-picture so you can follow along while you’re watching the tutorial. You can even slide the PIP off screen so that it leaves a small tab, and the audio continues to play. Next to the easy authentication it’s my favorite feature of the new app. By the way, want to know how I figured out you could do that? Well because he did a tutorial on how to use his tutorial app! SCO Member Tutorials allows you to toggle between zoomed and full screen. This is really helpful because it means the iPad tutorials can fill the entire iPad screen while you’re watching, but you can go back out when you want to see the wider aspect ratio of a Mac tutorial. Don will often do a series on a single topic. He reserves this for big changes like a new operating system release. These are some of my favorite shows because you get up to speed with the new tricks really quickly. How do you think I know so much about the Mac? It’s because of watching Don’s tutorials. Anyway, to make these easier to find and watch, he’s created curated Playlists. You can watch all about Sierra, all about iOS 10, all about Apple Photos and more. In a future release of the app he plans to let you create your own playlists, but for now I think this is a terrific way to get up to speed on a really involved topic. The only enhancement I’d add to the SCO Member Tutorials app for iPad and iPhone would be gesture support. I love how in Downcast I can simply swipe from left to right to go back a prescribed length of time. I use that all the time when I miss what someone said, and I especially like it when I’m learning something in a tutorial. Don is welcoming feedback and suggestions on the new app so I sent my request along to him. I downloaded it when I first heard about it from Don’s email. It’s terrific.